Security and policing costs for the 2012 Olympic Games should stay within the £600m budget, the government said. Home Secretary Jacqui Smith told MPs there are no plans to dip into a £238m contingency fund. But, she warned, those plans could change depending on the threat level in place closer to the time. Up to 10,000 extra police officers will be drafted in each day to help secure the Games, with most of the security budget going towards paying wages. The Olympic security strategy will be implemented in tandem with overall national counter-terrorism efforts. In a written parliamentary statement, Ms Smith said: "The strategy and the concept of operations are designed to respond flexibly to changes in the risks to the Games and deal with any unexpected events which may occur between now and 2012." 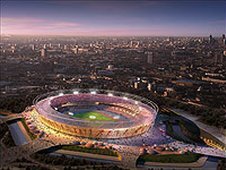 The Metropolitan Police have set up a dedicated specialist team to police the Olympic Park and businesses to help thwart would-be criminals and back up on-site security and co-ordination activities. The capacity of the force's digital radio system is also being boosted in the run-up to 2012 Games.